Mounds of multimedia data are creating an opportunity for HIM to provide information governance leadership. In a February 2016 article in the Journal of AHIMA, Patty Thierry Sheridan, MBA, RHIA, FAHIMA, and Valerie Watzlaf, PhD, MPH, RHIA, FAHIMA, put forth a model of adaptive leadership to provide a framework for HIM professionals to exercise information governance (IG) leadership. The article noted that "promoting an environment that embraces IG concepts and principles requires a major change in the management of information assets." Suggesting professional movement beyond the HIM traditional confinement to the EHR, Sheridan and Watzlaf wrote that "governing all types of information—the entire information life cycle—is crucial in order to have a successful IG program." For HIM leaders ready to move beyond the traditional electronic and paper boundaries erected in defining the legal EHR, the explosion of multimedia data presents itself as an enormous opportunity to manage new electronic information assets. In January 2011, the National Institute of Biomedical Imaging and Bioengineering and the Office of the National Coordinator for Health Information Technology cosponsored a workshop to discuss opportunities and implications for health care when EHRs contain multimedia. Today, multimedia images are cropping up all over health care, and the idea that they will be part of a complete EHR is becoming increasingly acceptable as part of quality, safe patient care. At the workshop, it was pointed out that "Images do not necessarily need to be directly included with the records if they can be linked in a way that is completely transparent to the user." If images are not an integral part of the EHR, the IG team will be tasked with keeping the systems maintaining the images in sync with the official EHR. If the HIM professional assessing the systems producing the multimedia information (soon to be an integral part of the EHR) has already participated in the construction of the enterprise's information asset inventory, a model for further documentation of image-generating systems is already in place. As the world of medical imaging grows, even small health care institutions will need to capture and organize the output of these systems as information objects. Physicians will not be the only ones generating volumes of images to be integrated with the EHR. Nursing and allied health professionals are already busily replacing written notes by using cameras to record pressure ulcer development and other types of wound development and healing. Speaking at a HIMSS 2017 Lunch and Learn panel, Ann O'Brien, MSN, RN, national director of clinical informatics at Kaiser Permanente, spoke about nurses using "Sneakernet," "an informal term describing the transfer of electronic information by physically moving media such as magnetic tape, floppy disks, compact discs, USB flash drives, or external hard drives from one computer to another rather than transmitting the information over a computer network." Nursing has also seen an increase in the use of cameras, which are passed around the department to take images that eventually become part of the record. Neither the cameras nor the methodology of taking wound photos is standardized. As part of an IG effort, standard equipment and protocols must be developed as these images join the EHR. There is also the issue of how to manage images sent to physician phones and the associated comments or orders. O'Brien talked about the movement toward a "patient-centered record" in which an EHR would have the functionality to compare photos of pressure ulcers over time, even mapping wound pictures over episodes of care. On the consumer side, the trend of patients photographing their wounds or body abnormalities may emerge as an IG concern. The issue of patient selfies is likely to be raised more frequently as remote care becomes more common. If such images are to become a part of the EHR, standards and protocols will need to be in place to determine appropriate inclusion. According to Sheridan and Watzlaf, the enormity of imaged files will result in HIM professionals having up to 80% more content to "observe and diagnose." Part of the documentation must consist of the types of images that will soon characterize the electronic chart world. For example, DICOM (Digital Imaging and Communications in Medicine) is a familiar image standard recognized by AHIMA leaders working on creating standards for all types of EHR content. It covers objects such as CT scans but may not include the cone beam CT for extremities that many orthopedists now want to use in a mobile setting. The role of photographs is growing, reflecting a lack of satisfaction with the scanned black-and-white images currently available in electronic charts. Clinicians desire 2-D or 3-D spatial pictures and holographic images that can be seen in open space. The capability of performing ultrasound studies in ambulatory settings nearly anywhere in an organization has facilitated this quest for better images. More dimensional visuals of the curves in ECGs are being considered. Genomic and proteomic displays, particularly for research, must be retained and entered into retention schedules, requiring IG updates to accommodate views over potentially hundreds of years. Studies at the multidimensional pixel level, called arrays, require observation and consideration. With image system growth escalating, it is critically important to apply the principles of an IG framework as soon as possible. The observation and diagnosis phases should provide a springboard to the next stages of the project plan. At the HIMSS 2017 Lunch and Learn session, Cheryl Petersilge, MD, chair of the department of radiology at Hillcrest Hospital in Ohio and vice chair of regional radiology at the Cleveland Clinic, spoke about the impressive gains the Cleveland Clinic has achieved in its quest to develop an enterprise imaging system. In fact, the image governance measures under development at Cleveland Clinic could serve as a model for other health care entities. The panel remarked on the episodic nature of EMRs and the tendency for each vendor-specific EMR to be specific to one setting. In multiple settings, these EMRs cannot upload pictures or other images. In addition to this shortcoming, no IG structure is in place for making the EMRs an enterprise system. An IG group such as the one at Cleveland Clinic must create an organizing principle for standardized image acquisition in which both the image protocol and the means to attach it to the encounter are exactly the same throughout the organization. In the search for an enterprise imaging system, there are several technical challenges that will require IG interventions. For example, image size and volume must be factored into the equation. In a large health care system, the multiple existing proprietary imaging solutions already purchased by various medical specialties and ambulatory entities create or capture images of various size, resolution, and purpose. The IG challenge is to determine what resolution is medically necessary, the amount of electronic storage space required and available per image, where the images will be stored (this is where cloud solutions come under discussion), who will create an index of the images, and how the images will be named and defined. Cleveland Clinic has solved the last concern by engaging clinicians from all quarters to develop one of health care's first ontologies featuring common definitions for all image types and their relationships to each other. Desirable technical characteristics of an enterprise imaging solution include an organizational tool to manage the volume and size of the impending flood of images. 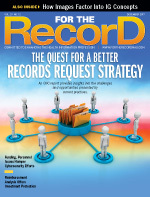 In the April 2011 issue of the Journal of Digital Imaging, Steve G. Langer, PhD, DABR, CPII, of the Mayo Clinic, said, "Data storage challenges faced by researchers can begin to require professional information technology skills." Langer believes IG teams will encounter several roadblocks, including "processing and data mining on nonstandard file formats, and relating those files to their DICOM standard descendants." He adds one remedy may be a solution that "scales as the researcher's need grows by leveraging the on-demand provisioning ability of cloud computing." In addition to the resolution of multiple technical barriers, IG groups must make efforts to reduce practice variation. As technology delivers the wherewithal to enable just about anyone to take images—for example, the ability exists to take ultrasound studies in most ambulatory settings—IG groups must be in place to guide appropriate credentialing of those "photographers" and reduce practice variations both to control costs and to ensure that the resulting studies or images will be worthwhile to clinicians and support quality care even if the patient visits a provider outside of the enterprise system. Patient safety involves IG oversight of images—in fact, the limited financial resources available to health care entities necessitate it. Organizations should be able to guarantee that patients can access a lifetime of radiation loads and never undergo unnecessary or redundant radiological imaging because the original films could not be found, did not have adequate resolution, or reside in another health care system in which interoperability solutions are unavailable. IG should also be able to deliver patient identity solutions that can provide patients with all their images and reports in one centralized electronic record viewable from anywhere at any time. As part of creating a longitudinal medical record accessible over a patient's lifetime, IG is responsible for the oversight of safe and secure storage of patient information, including images. As a result, HIM educators must consider new curricula to ensure graduates can manage this complexity, with the understanding that an EHR is not merely a replacement for a paper chart. Rather, it's an active dynamic entity full of multimedia demanding complex legal and technological support. Further education in long-term electronic storage alternatives, including cloud technologies, must become familiar HIM terrain. In short, IG is not just for today or tomorrow but also for HIM generations to come.